2017 was an opportunity for the Telecom & infrastructure entity to strengthen its position as a leader in the design, deployment and maintenance of telecom infrastructure in Africa, one of its areas of development. 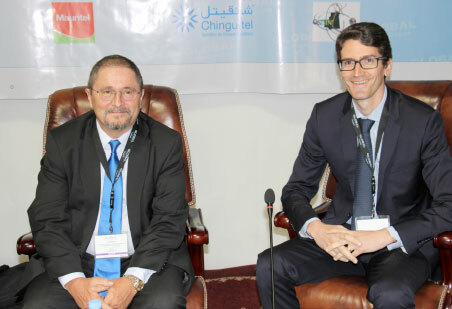 GLOBAL Technologies thus participated in 4 important conferences on this continent: In Mauritania, on May 16th 2017 in Nouakchott on the theme "infrastructure and telecommunications networks emerging in the African continent: Focus on Mauritania "
Simultaneously propose services of optimal quality and at reasonable cost. This particularly successful conference gathered more than 800 participants from all sectors for the first edition. The goal was to communicate and give visibility to the ambitions of “Digital Mali 2020” and find new investors to accompany this digital transformation. GLOBAL Technologies seized the opportunity to exhibit its expertise in these areas by delivering a well-received presentation. We also forged many new relationships to increase our visibility in this country and to present ourselves to Ministers. It was also a perfect occasion to display our experience and know-how from working on similar projects in other African countries. Prior to the Conference "Invest in Mali" in December, the Ministry for the Promotion of investment and the private sector wished to organize a workshop and invited GLOBAL technologies to take place on a discussion panel on August 3rd 2017 in Bamako to discuss "Optimization issues of telecommunications networks in Mali". This top level meeting aimed at presenting Niger’s strategic vision in infrastructure, telecommunications, transport, energy and mines to private partners. This proved a golden opportunity for GLOBAL technologies and Nicolas Mercier to meet private stakeholders such as Niger Poste, the ANSI, Niger Telecoms as well as the main ministries and to lay the foundations of a collaboration between GLOBAL technologies and the State of Niger. "This conference allowed us to strengthen GLOBAL technologies’ commitment in the development of Niger to Niger’s economic stakeholders in the private sector and to State agencies. Thanks to our Group’s advanced technologies capabilities, we are able to connect the most remote areas and provide Internet connection to rural populations. These solutions are well adapted to a country as large as Niger." Nicolas Mercier stated at the end of this meeting.